A WordPress site and it’s Phase I, with Phase II being the Magento e-commerce section which is being rolled out in early March. This was a turnkey project – All the copy writing, graphics, desgin, the images, navigation and optimisation. The full monty. The site quickly received very positive feedback from the design legends at German company Jung, and the Google SERPS on high priority keywords was fantastic – we were number 1 for the main one within 4 days of launching the site. 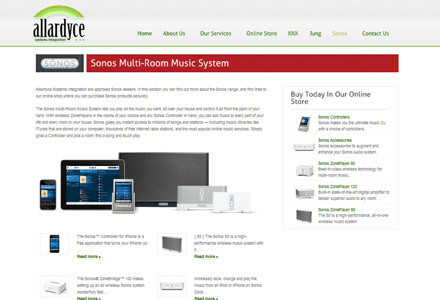 Overall a clean and unfussy site which aligns itslf very well with Jung’s site, and also adheres to the brand guidelines for Sonos.